NASA wants to take pictures of Mars. So, researchers are working on a tiny, custom-made helicopter. The softball-size, two-rotor aircraft would be the first to fly the skies of another planet. It is also symbolic of the commitment NASA is making to the red planet, and its aerospace partners. Investors should take note. This Mars thing is going to be big. 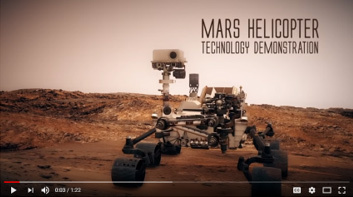 NASA has been at the Mars exploration business for a while, learning from each mission. In 1997, the Sojourner rover landed successfully in July, but communications were lost in September. 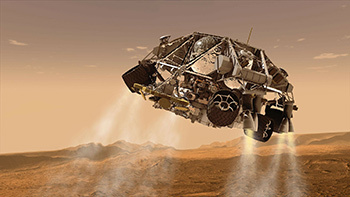 The Spirit rover landed in January 2004. It traveled 4.8 miles before its wheels became trapped in the coarse Martian sand. The rovers Opportunity and Curiosity landed January 2005 and August 2012, respectively. And due to iteration and refinement, both vehicles are still operational today. The newest explorer, a helicopter, would give scientists an alternative view of the planet’s landscape. The “Marscopter,” a helicopter, would give scientists an alternative view of the planet’s landscape. After this “marscopter” lands, expected in February 2021, NASA engineers say it will use attached solar cells to recharge its lithium-ion batteries, and warm up its moving parts. Then researchers at mission control on Earth will command the aircraft to the sky. Like other Mars explorers, the helicopter will look for signs of ancient life, and attempt to access the suitability of future human exploration. Human exploration is the opportunity for investors. Everything NASA is doing now is prep for a human mission to the red planet. The lead times for these projects are very long. Costs escalate, continually. And most important, there is very little free-market competition because the number of qualified participants is small. In 2012, NASA administrators began making plans for Mars 2020, the current helicopter exploration now making headlines. Space News reports the original estimate for the project was $1.5 billion. By 2016, the cost had ballooned to $2.1 billion, plus $300 million for mission operations. Thus far, study contracts for Mars exploration and orbiters have been largely relegated to Boeing (BA), Lockheed Martin (LMT), Northrop Grumman (NOC) and SSL, formerly Space Systems Loral. And that is just the Mars end of the business. Recently the U.S. Air Force decided to sole-source the development of next-generation missile defense satellites. The winners were Northrop Grumman and Lockheed Martin. A month ago, NASA researchers launched an Atlas V rocket carrying two small spacecraft that will orbit Mars perpetually, beginning in November. The Atlas V rocket system is a joint venture between Boeing and Lockheed. It is difficult to find any space projects that do not involve Boeing, Northrop or Lockheed. This is especially important now that defense and aerospace budgets are rising to record levels. From my decades of investment research, I have found that one of the surest routes to success is finding companies with durable competitive advantages, or what the legendary investor Warren Buffett calls a moat. Defense and aerospace companies have entrenched competitive advantages because their customer, mostly the U.S. government, is reluctant to consider competitive bids from fledgling, or foreign, firms. This translates into great earnings visibility and spectacular performance for shareholders. I have been urging my members to wade into defense and aerospace stocks. The major stocks have fallen off recently given the perception the world is becoming a safer place, as President Trump heads to North Korea for a historic summit. 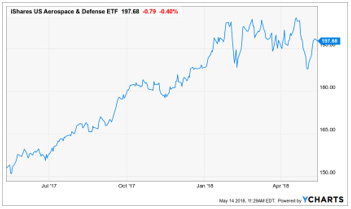 The U.S. Aerospace & Defense ETF (ITA) is up 29% year-to-date. Lead times for defense and aerospace projects are long. Most commissions are already set in motion, and there is no public will to change course, even if world peace suddenly breaks out. Plus, space is a hidden win for the biggest firms. As information technology progresses, the U.S government is pushing more of its budget toward space. Leading firms are being awarded high-margin development projects — often without competition — on a regular basis. 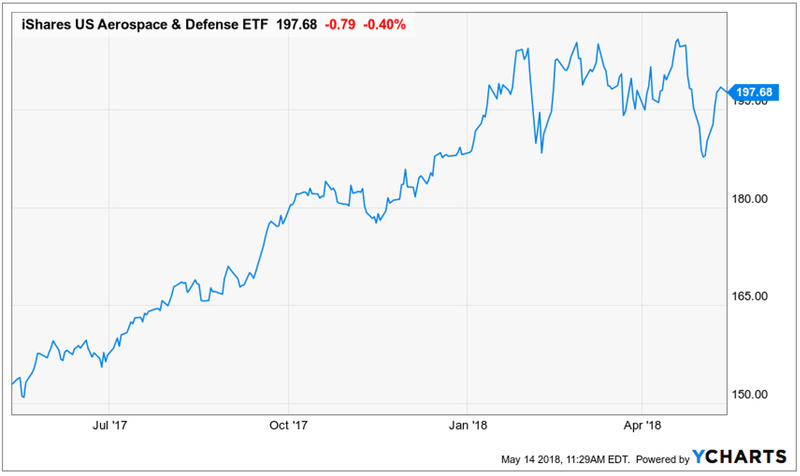 This is the best of times for defense/aerospace companies. It is also a golden era for investors. Lockheed had 8% sales growth in 2017, to $51.1 billion. 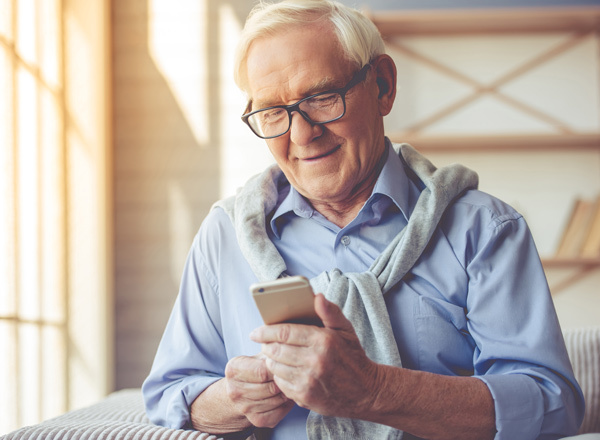 The five-year compound rate of return to shareholders is 28.3%. P.S. 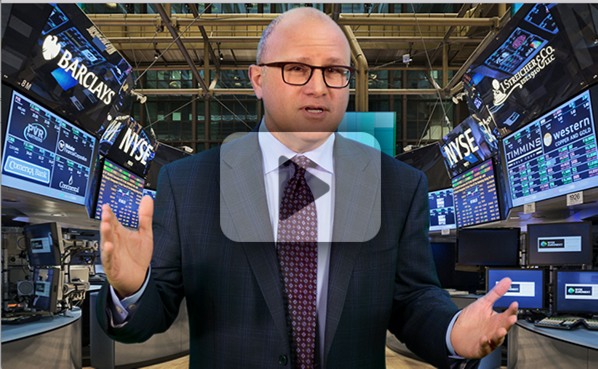 To get more ideas like this — with complete buying information, plus my detailed profit targets and sell stops — in your inbox every month, click here.